At this stage of his life Shaw wanted to be a novelist and had just started writing ‘Love Among the Artists’, of which he had high hopes. Shaw’s first known love affair was with Alice Lockett who he met at his uncle Walter’s house in Leyton (not necessarily whilst he was ill, but quite possibly). Shaw also says that his only paid employment in this period of his life lasted only a day or two , “when I earned a few pounds by counting the votes at an election in Leyton” in 1881. Shaw’s description of Leyton is (like other aspects of his reminiscences) misleading. “Soon, however, east London spread and swallowed up Leyton. The country houses of his patients were demolished and replaced by rows of little brick boxes inhabited by clerks in tall hats supporting families on fifteen shillings a week. . . .” Walter Gurly’s house fitted a doctor’s high status but was part of the 1860s development which filled the grounds of the Grange mansion and included some small terraced houses where an ornamental lake had been. The pace of building new residential streets was far too rapid for it to escape anyone’s notice. The area promised many new patients but most would have been frightened of a doctor’s bills. Before Shaw came to Leyton in June 1881 he had become a vegetarian, but his uncle insisted on him eating meat. He was only able to go back to a meatless diet after he left Leyton at the end of September or early October. 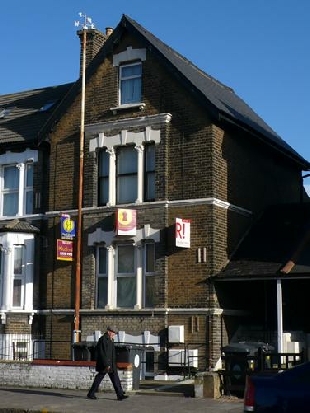 Uncle Walter Gurly lived at Holly Lodge until 1891 when he moved to 200 High Road, Leyton (which initially was known as 4 Fairmont Villas, Leyton Road). This was then a new building near the railway station for Liverpool Street, but to modern eyes at least not as attractive as Holly Lodge. He died at 200 High Road on 30th August 1899, at the age of 64, of diabetes and ‘manic convulsions’.